In March 2004 an article I wrote was published in the award winning environmental and conservation magazine, Africa Geographic, about the Maxine, Science, Education and Awareness programme (M-SEA), an AOCA initiative, in collaboration with the Two Oceans Aquarium. Soon thereafter Maxine was satellite tagged and released. Now five years later another article I’ve written has been published in the September issue of Africa Geographic which is downloadable on the AfriOceans Conservation Alliance website from the 25th August, as well as a podcast. Both the article and podcast reflect back on Maxine’s release, and on the other sharks we released, including the many other successes, as well as hard lessons learnt when we lost two of our sharks. 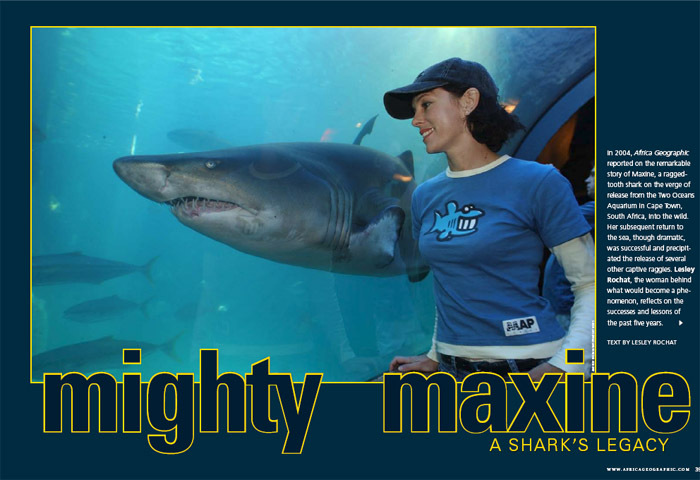 Overall Maxine was, and still is, a fantastic ambassador for sharks. 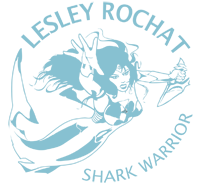 The international success of the programme helped tremendously to raise awareness about the plight of sharks, and assisted in changing perceptions of sharks, in particular through the Rethink the Shark campaign, created for the AOCA and the programme by Saatchi & Saatchi, Cape Town. I would like to use the renewed awareness of this special animal to direct traffic to the AfriOceans Petition for protection of our sharks. We will be submitting the petition at the end of September and need all the help we can get to make sure we have impact – please go to PETITION and add your voice. Thank you! I have an inbox filled with items marked in red, yet I have spent my afternoon watching your shark videos. It seems so sad that we need so much. I am not sure that awareness will save us, or them. Perhaps something cataclysmic is all we can hope for.